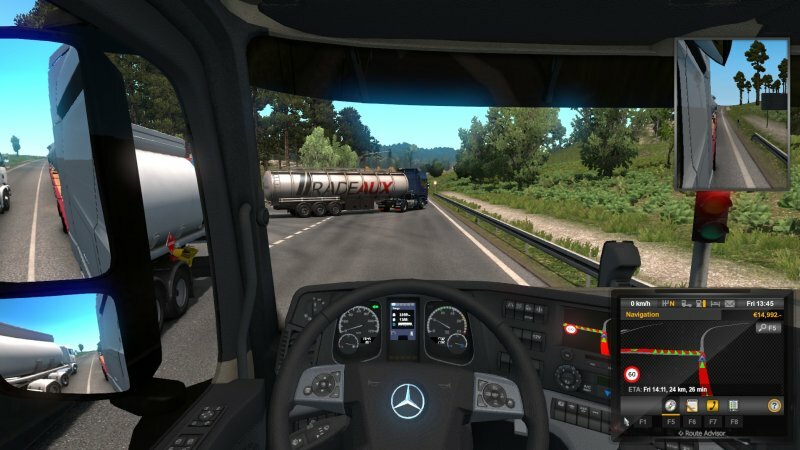 I have to admit, when I first heard about a game that is essentially a truck simulator, my first reaction was, what the hell? 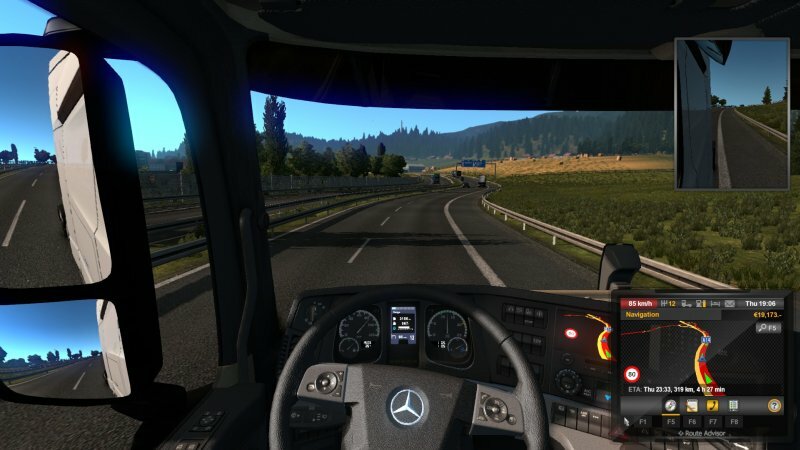 Why would anyone bother developing - let alone playing - a game where you lug heavy workloads across Europe at moderate speeds, snail-pace acceleration, and with long, boring slogs of roads between your source and destination? Ah, little did I know how crazy and addictive this idea was. Unsuspecting, I installed the game and went about exploring. After finishing the rudimentary tutorial showing me how to operate the user interface, I started doing quick jobs. Minutes turned into hours turned into more hours. 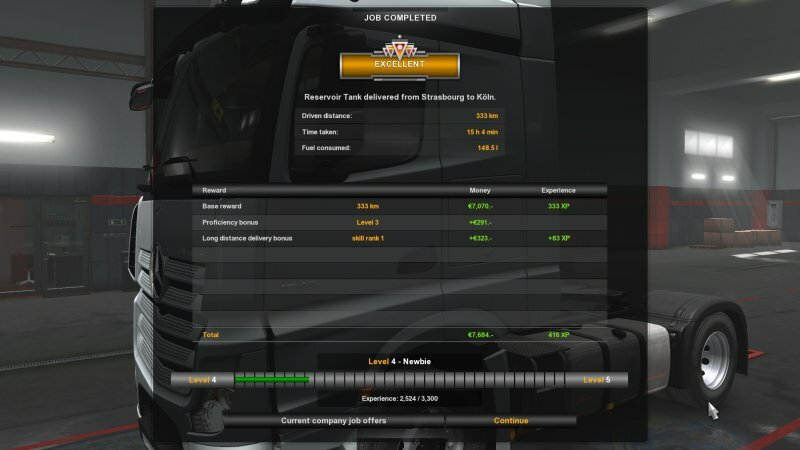 I was sitting here, sweating, fretting, CARING about my truck business. Whatever the game developers did, it's a mind trick of the highest order. After me. You like driving, don't you? 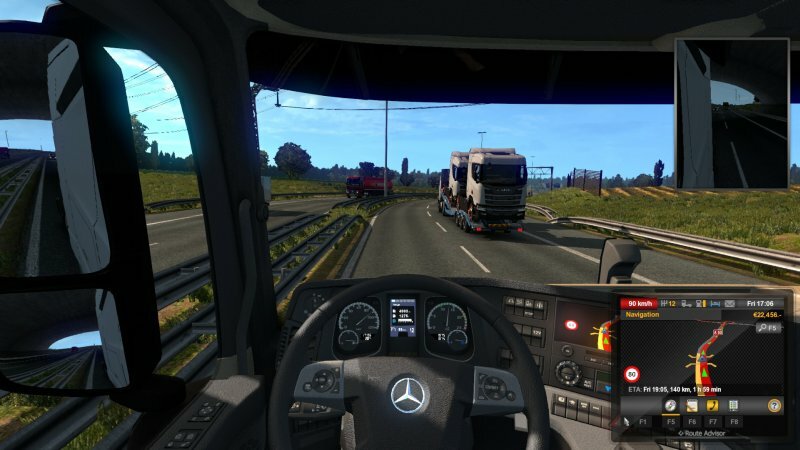 Euro Truck Simulator 2 is designed to be ... precise. That's the best word to describe it. 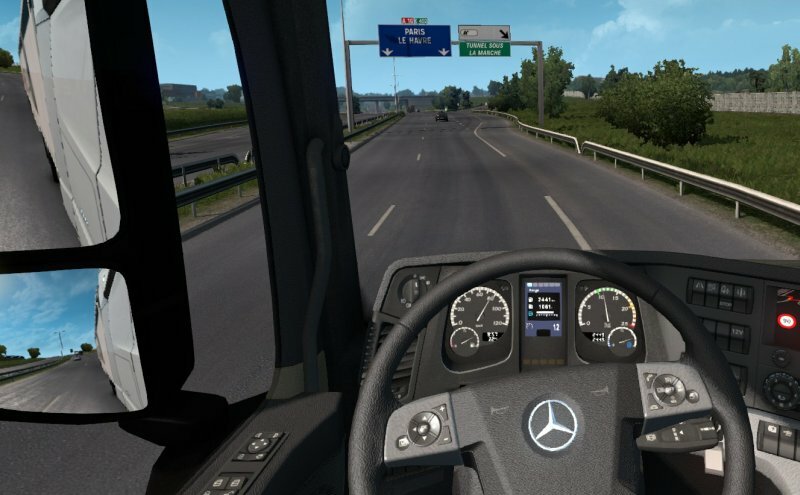 Trucks have three different types of brakes - and you have controls for all. If you want to shift manually, you can, and that usually means twelve forward gears and four reverse ones, and they do matter when you're carrying a load. 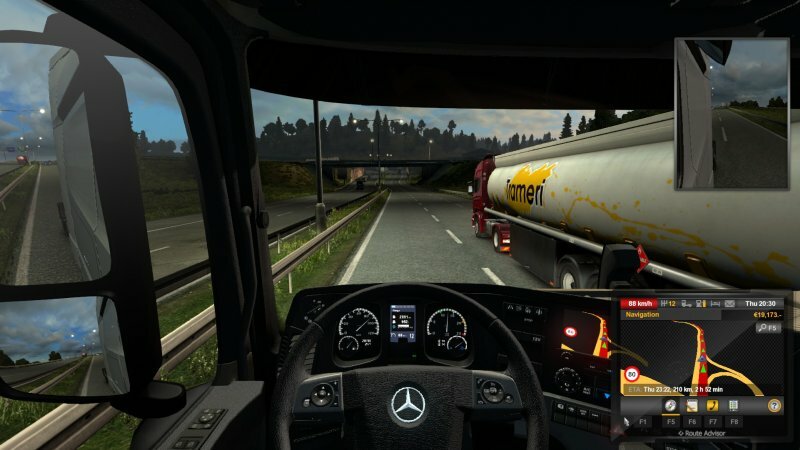 Fuel economy is critical with 25 tons of something behind you. Narrow streets, so watch them mirrors. Speed limit is only 80 km/h, make sure you don't get a fine. Navigation? 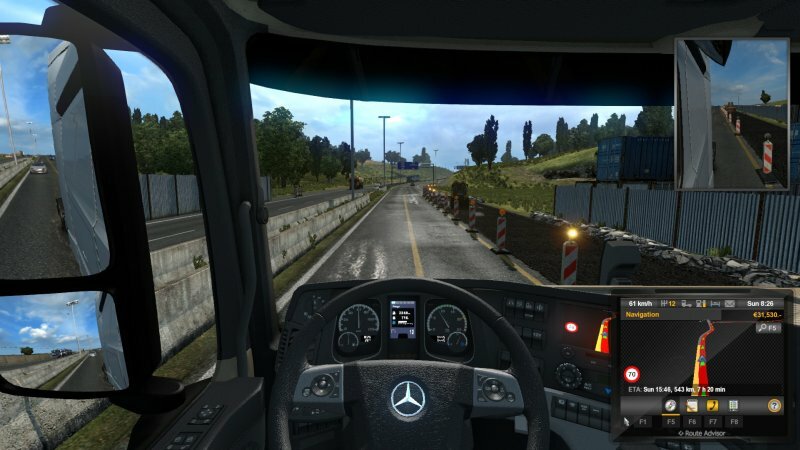 Check, proper satnav, the way you'd do driving for realz in Europe. Amazing. 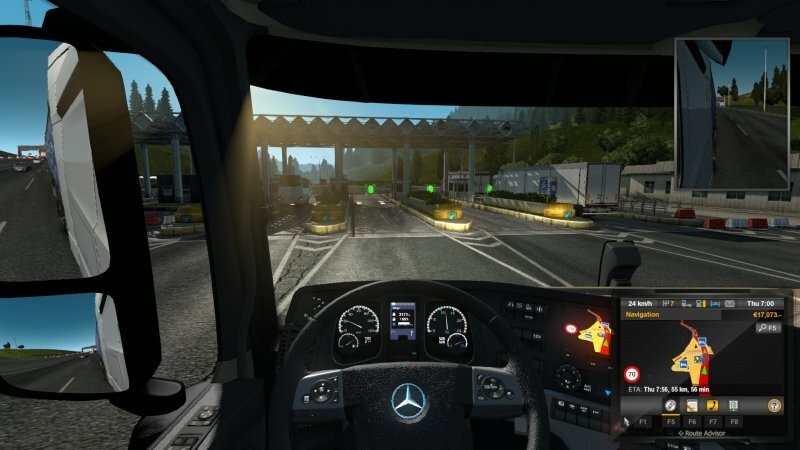 In essence, the game is about establishing and then growing your shipping business. You start small, poor and truck-less, and you work as a contractor for other companies. 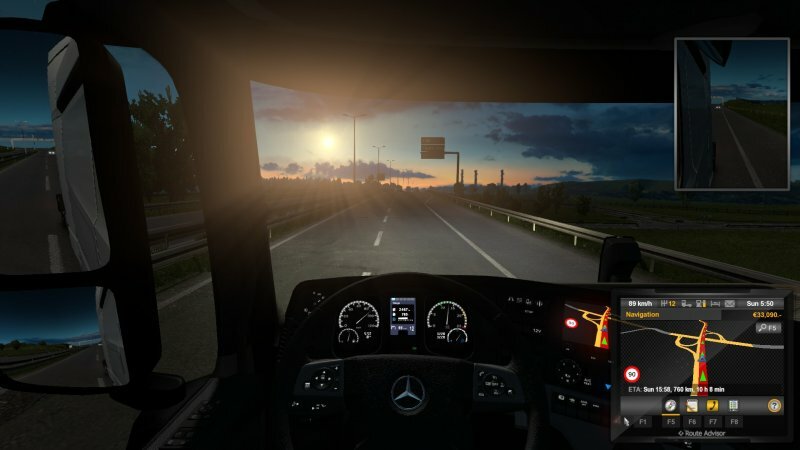 You don't need to think about the vehicle - one will be provided for you with each quick job, so this also gives you an opportunity to familiarize yourself with different truck models and cabin interiors, different countries, and you also learn about the world. 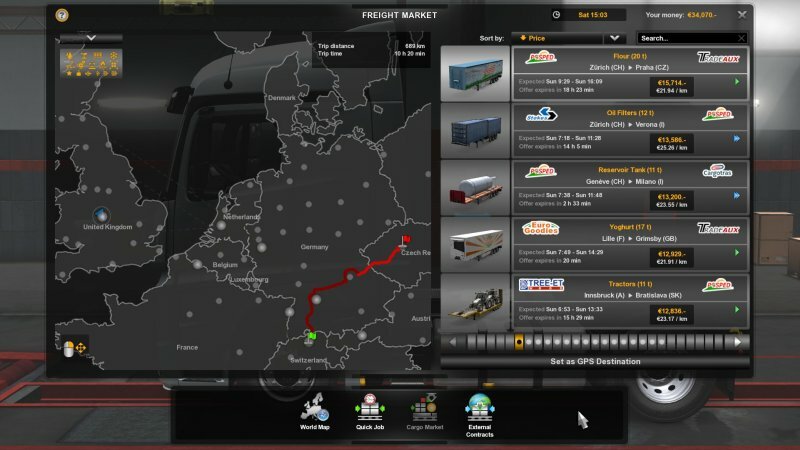 You discover workshops, dealerships, garages, and centers where you can hire other drivers later on in the game. You gain experience the more you drive - and the better you do that too, as accuracy, time and damage all count - and you get paid for your work. 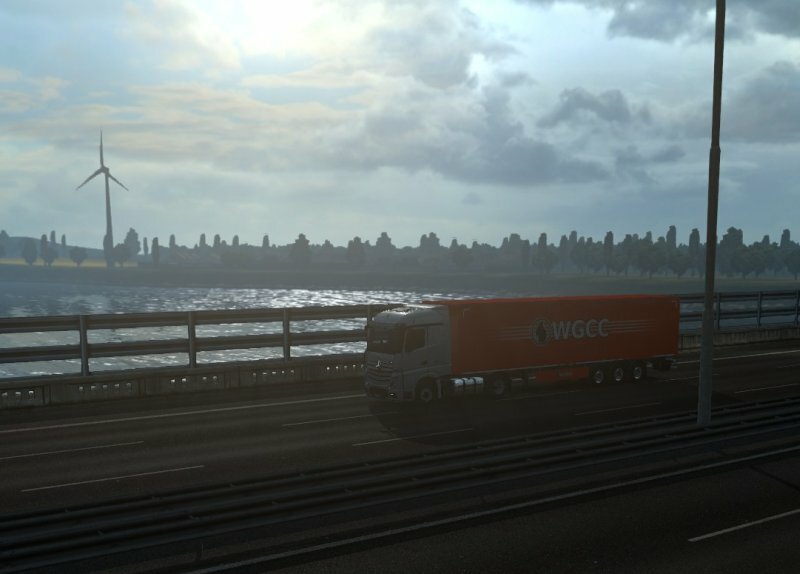 Choose a job on the freight market. And drive! After a while, you might get a letter from a bank offering you a loan, so you can actually buy your own truck. This means you have to take care of everything - maintenance, repairs, fuel, but you also get paid more handsomely, as there's no contractor company in between you and the customers. 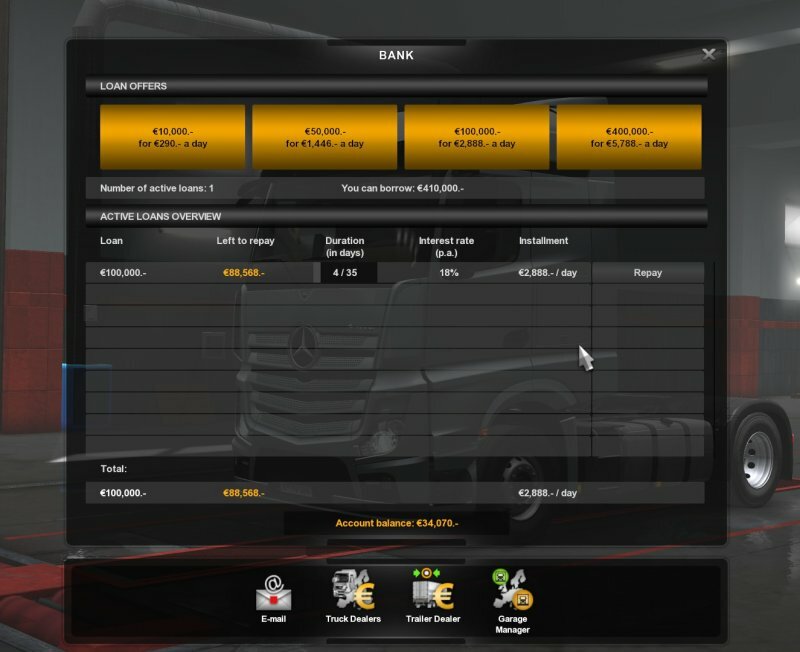 You do haulage, you gain more experience, and you start paying off your bank loan. If you do things right, you will get further loans, allowing you to rent a better garage, buy other trucks, and hire your own crew. And it all feels real. Oh so real. You care. You really care. 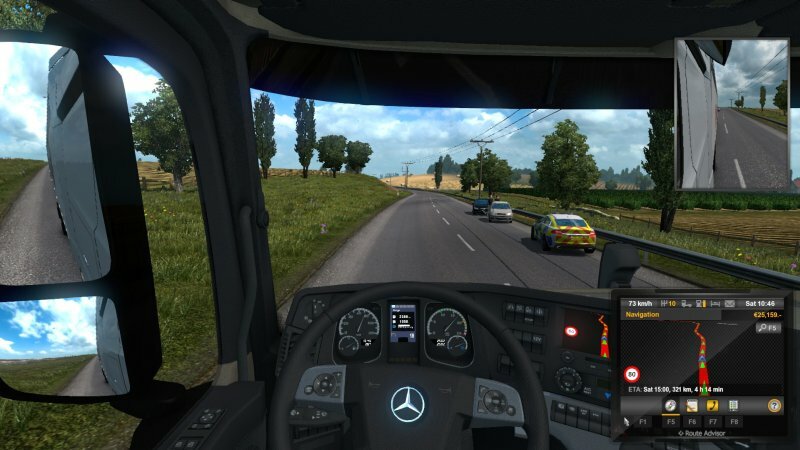 I never thought I'd feel attached to a vehicle, but the way Euro Truck resonates, it makes you deliver a sense of responsibility and accountability, and you really zone into what you're doing. Early shifts while the engine RPM is in the green band. 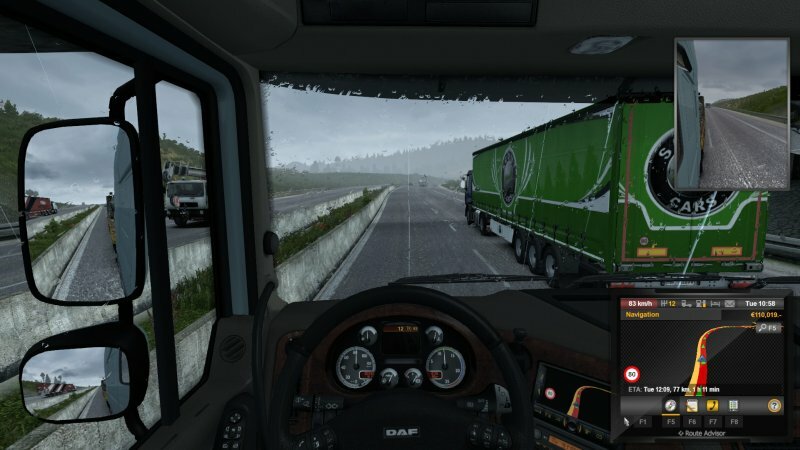 Slow acceleration and the use of the exhaust brake. 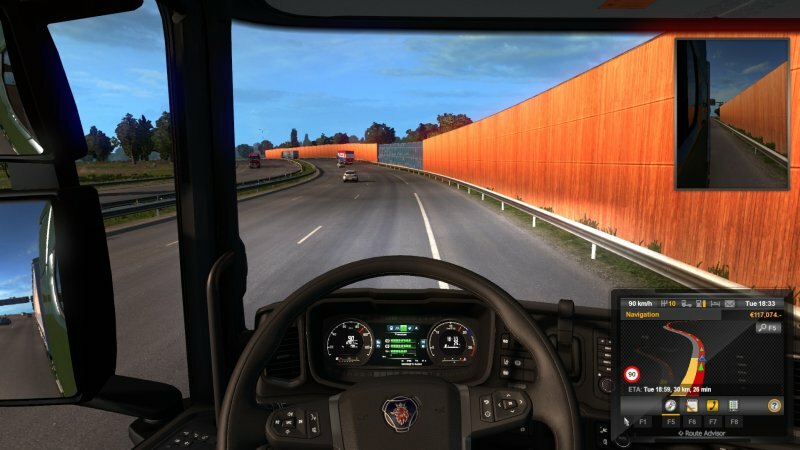 You make sure you corner carefully, so you don't rub your trailer against guardrails or buildings, and some of them can be narrow, proper Europe style. You keep the speed down. Doing 90 km/h in the 80 km/h zone. Is that bad? Should be fine, shouldn't it? Once or twice, I did some minor damage, and I felt really bad. 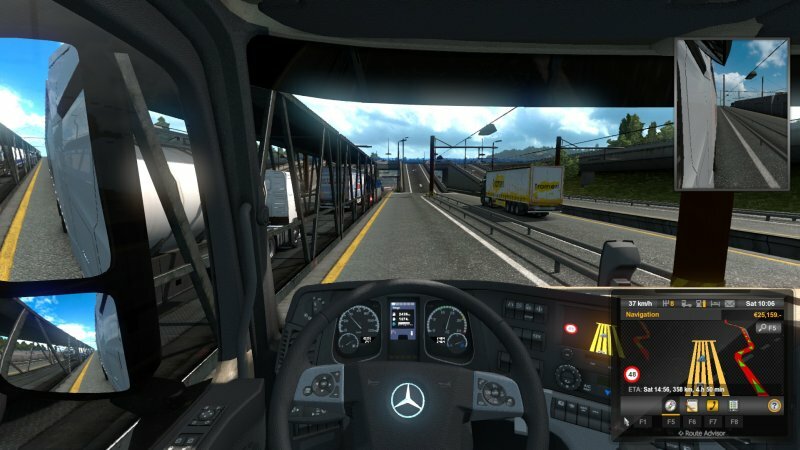 Another time, I actually got a hefty fine in Switzerland (of course), going into a tunnel. The speed limit changed from 80 km/h to 50 km/h, and I wasn't paying attention, and I got an instant EUR280 fine. Damn. A rollercoaster of feelings. The game is designed superbly. Everything looks top notch. If you're driving in the dark and flash your lights to warn the incoming traffic on roads without middle separation, they will flash back, as you'd expect from people who respect road etiquette. You also have to rest, so if you go on for too long, you'll get a fine. 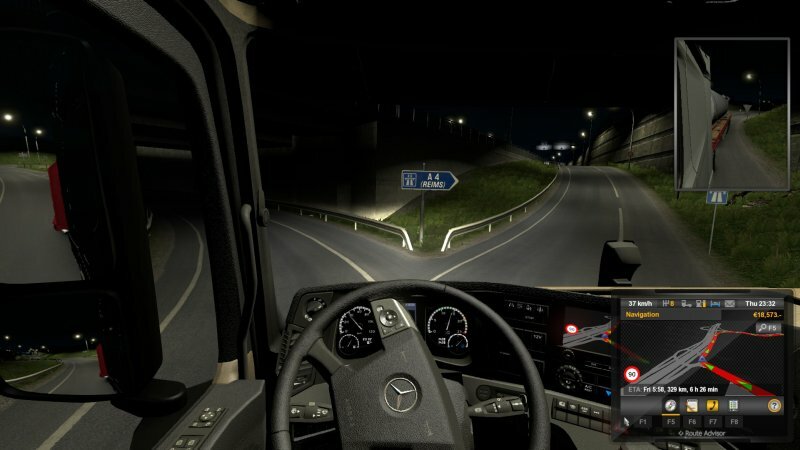 Every eight or nine hours of driving, you actually have to pull into a rest area and take a nap. There's rain, there's fog. 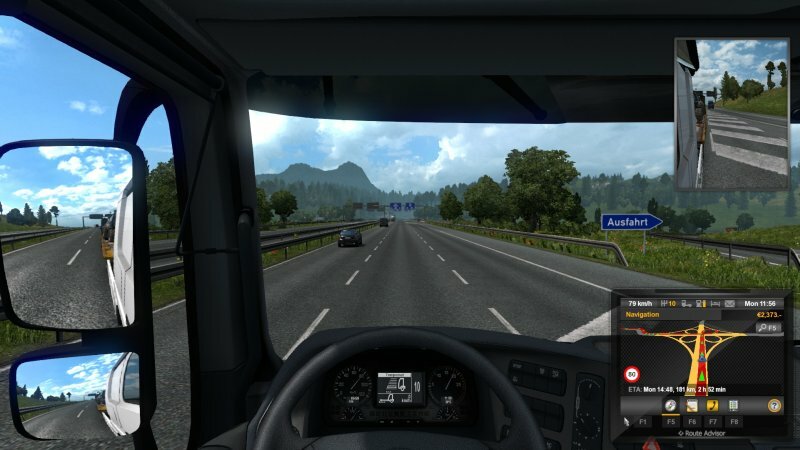 I also decided to drive to Britain, to see what it's like there. Indeed, the speed limit changes, you drive on the wrong side of the road, and everything. Before that, you actually need to board the channel train. Wicked. It's really cool. 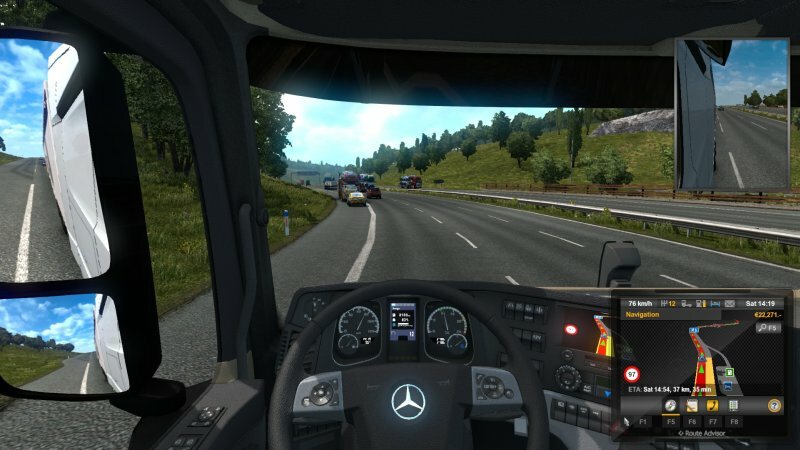 The city centers are made simpler, of course, than they would normally be, because something like that would require immense computation, but you still get lovely scenery, hills, curves, narrow country roads, highways, and the biggest city in Germany, Ausfahrt. And here it is, the biggest city in Germany. 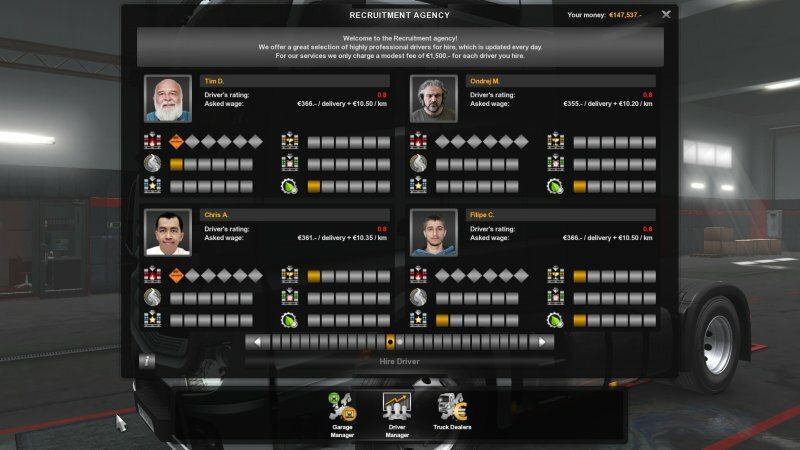 You also get police cars, and they will sometimes stop AI vehicles when they're speeding. 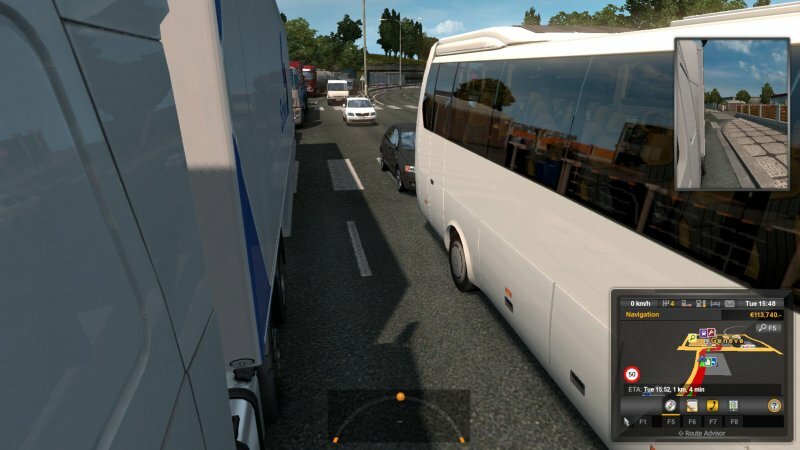 There are also different personality types programmed in the road traffic, and when you want to merge, you will have anything from polite people to rude idiots trying to compete with your truck. This only makes the game even more engrossing and fun. Po-po in Britain; notice the car color pattern. All very realistic like. Toll road. This game got it all figured out. You can also add your own music! 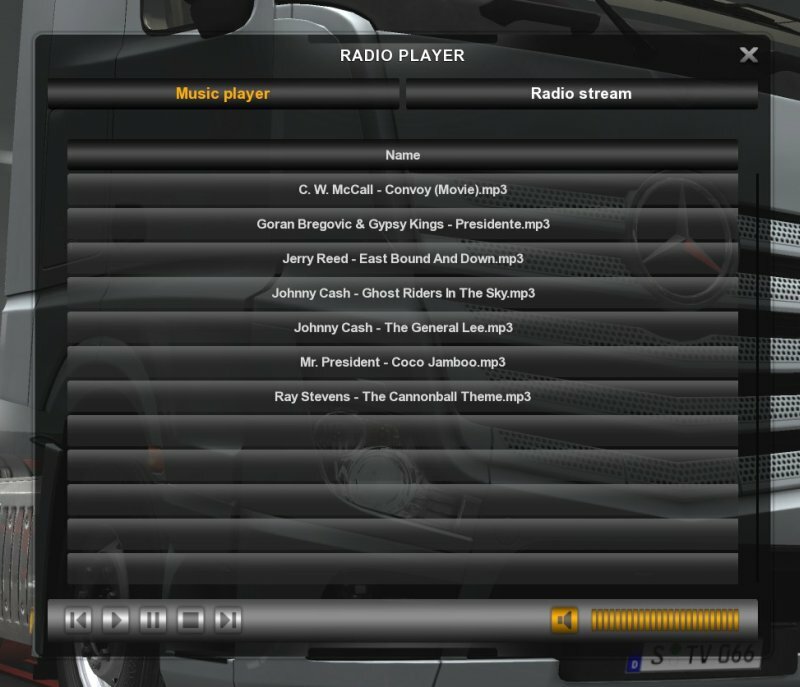 Instead of listening to the in-game tunes, you can create your own custom playlists. Which I did. And then there I was driving while listening to Convoy or Cannonball Run. It can't get any more dope than this. Simply awesome in every imaginable way. Road works, with warning lights and everything. Sunrise coming out of the tunnel, after a short stint in Great Britain. Being overtaken by a caravan, what's up with that. There be traffic jams, too! Beautiful vista, chillaxing music. Total fun. 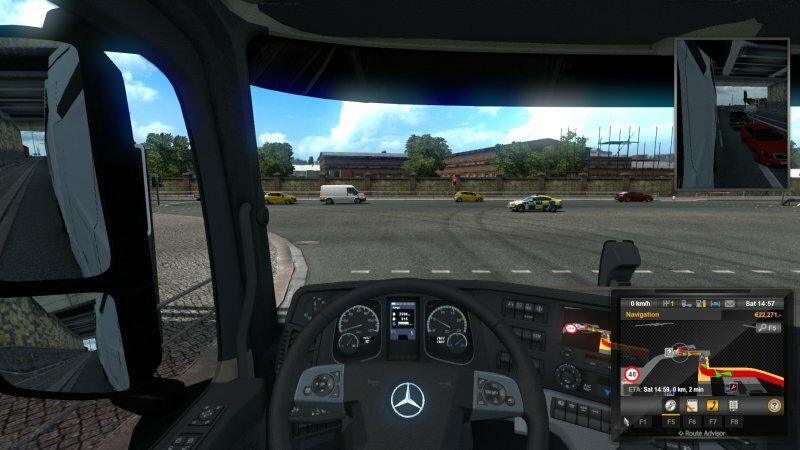 Euro Truck Simulator 2 is a fantastic game. I'm so happy to have found it - and decided to play, as I had it in my arsenal for a year or two. It's got everything - a need for speed, a need for skill, drama, tension, you actually care, and the devilishly simple premise turns out to be full of twists and turns - literally. This title blends strategy and simulation in a unique fashion. Some games manage to pull this off, but most either focus too much on one or the other. Yet, somehow, the seemingly most boring concept that could be has been designed into a thrilling, captivating game. Really splendid. 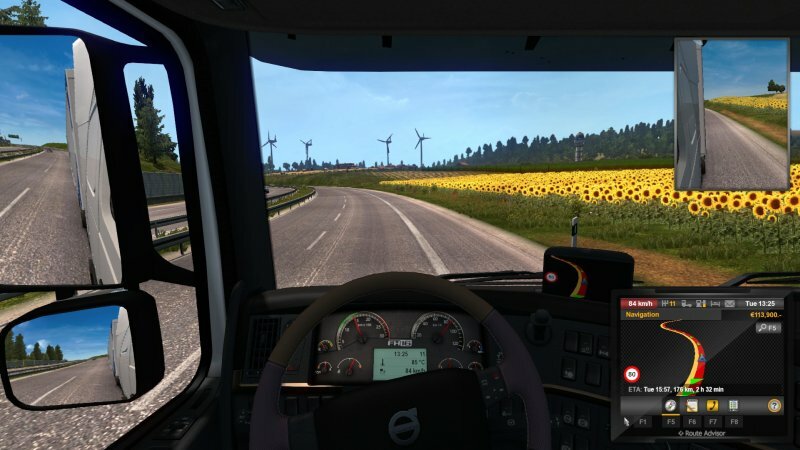 I hear there's also American Truck Simulator. Well, you know what that means. A real convoy!